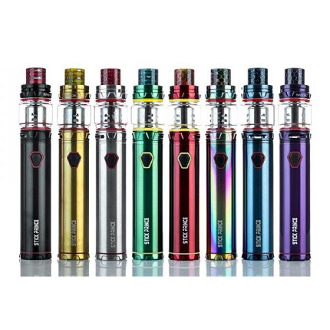 The Stick Prince Vape Kit from Smok is a pen-style vaping device that utilizes the TFV12 Prince 8ml tank and a powerful built-in 3000mah battery. This great palm-sized kit will satisfy all your vaping needs without taking up a lot of extra space. The Stick Prince is charged using a micro USB port and the designated charger included in this kit. It has a voltage range of 3.4V to 4.2V and implements some great protection features including low voltage, low resistance and short circuit protection. It also has an 8 second cut off for added protection. The TFV12 Prince Tank has a maximum capacity of 8ml and utilizes a new top-fill, button-locking top with a hinge for easy access. It is 510 threaded and has a wide bore drip tip. There are duel adjustable airflow slots that are wide and allow for plenty of air flow as well.